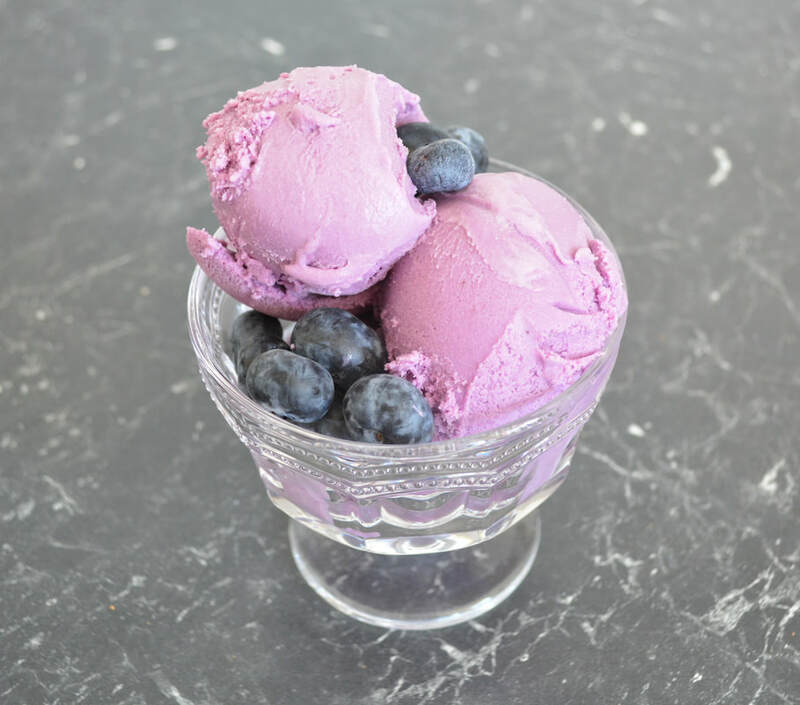 Blueberry ice cream, I cannot believe the colour that you get from blueberry ice cream, it is so amazingly beautiful. This ice cream is delicious, it is creamy, easy to scoop out and is a perfect summer treat. But here's a secret, if you are like me and you eat ice cream in winter in front of the heater, you can make it with frozen blueberries, so it is actually a year round ice cream. The taste of the blueberries will determine the outcome of your icecream. Use flavoursome small blueberries, they seem to work best. They give the ice cream a great flavour. I have used really large blueberries, that were very mild flavoured blueberries and the ice cream was light in blueberry flavour, tasted like vanilla ice cream to be honest, but just serve them with fresh blueberries on the side and that problem is fixed. So my advice pick the fresh small flavoursome blueberries, or go with frozen. Now thick cream comes in 300ml containers, so in all honesty I just add 2 x 300ml of thickened cream into the mix, but if you want to be accurate 2 cups or 500ml is all that is needed. I use a cheap ice cream machine I bought from K-Mart, if you are new to ice cream making don't go out buying a new expensive one until you really start loving to make ice cream. I have since bought a new one, but I will use the cheap one until it breaks, then I'll start using the new one. If by chance, your ice cream did not churn properly, it is a bit runny, freeze it like that for 4 hours, or until just set. After 4 hours place the ice cream in a food processor and blitz until creamy and smooth. Then refreeze and your ice cream will be perfect. I put the blueberry flavoured syrup in the recipe as sometimes the blueberries are light in flavour, so although I love it still, it can taste like purple vanilla ice cream. The syrup you can buy from IKEA, don't use normal cordial, you really want a concentrate. 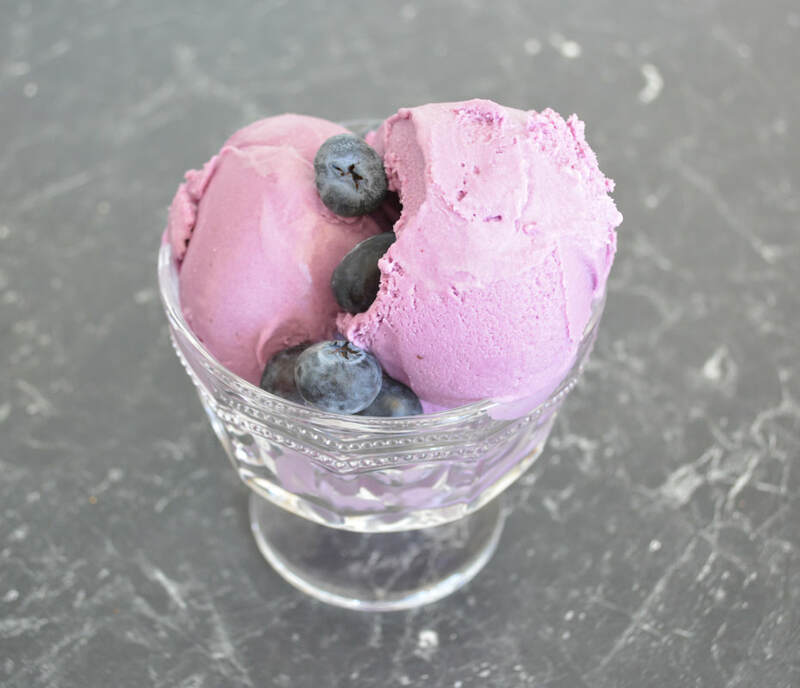 So if you love blueberries or just love the colour purple or you just love ice cream, make this, I love homemade ice cream, hope you do to. Combine 1/4 cup of the sugar, blueberries and lemon juice in a small saucepan set over a medium heat. Stir until the sugar has melted. Bring to a boil and mash up the berries. Place a fine mesh strainer over a bowl, pour the blueberries into the strainer and push the berry mixture through, discarding the skins. Set aside the blueberry puree. Add 1 cup of the thickened cream and vanilla to a medium sized bowl, set aside. Combine milk, remaining thickened cream, remaining 3/4 cup caster sugar and salt to a medium saucepan set over a medium heat. Stir to dissolve the sugar. Allow the milk to heat up, but don't allow it to boil. Meanwhile whisk the egg yolks in a small bowl. When the milk mixture is hot, slowly drizzle 1 cup of the milk mixture into the yolks, whisking continuously. Pour the egg mixture into the saucepan, followed by the blueberry puree. Stir to combine. Continue cooking until the mixture coats the back of a spoon. Pour the milk mixture into the cream and vanilla. Stir it all together. Place uncovered in the refrigerator for about 30 minutes, then cover and leave for about 2 hours to chill thoroughly. You can leave it overnight. Once the mixture is cold, churn in an ice cream machine according to manufacturers directions. It will thicken and look like ice cream.